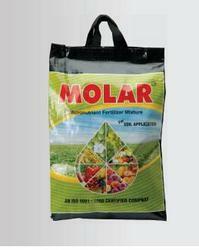 Our range of products include multi micronutrient fertilizer(soil application). Agri Search has done an extensive research in the barriers that make the nutrients unavailable to the plants. Among these barriers are soil reaction, electrical conductivity, CEC (Cation exchange capacity),Organic carbon, water holding capacity, soil structure & texture etc.These barriers adversely affect the availability of micronutrients from the soil.Molar provides Zinc, Iron, Manganese, Copper, Boron, Magnesium,Silica, etc. in a balanced proportion as grades notified by the concerned state government. Benefits:-Along with salt of all microelements, it contains 100 % all natural buffer (micro amorphous Silica) which has got following beneficial properties. parasite as the sharp edges of the diatoms puncture insects skeleton & then powdery MAS absorbs the body fluids causing death from dehydration. facilitates the air circulation around the root zone & water logging is minimized.High Cation Anion Exchange (CEC) a higher CEC means a medium will pass nutrients to plants roots easier & more effectively. The MAS in MOLAR has a high CEC as compared to clay particles. Dose:- 10 to 20 Kg/ acre. fungicides. Do not use with Phosphorous containing compounds. Looking for Multi Micronutrient Fertilizer ?